I have a LOT of LEGO. Let’s just get that out of the way. I have more LEGO than most toy stores. I’m always looking for more! This is what led me to the recent purchase of a Large LEGO Lot* (LLL). Two purchases actually. Well, it was the same collection broken into two LLLs purchased a couple days apart. But I digress. When this lot came up, I wasn’t thrilled with it, but thought I’d give it shot. I wish I would have saved the pictures in the first ad so you could see what I mean. 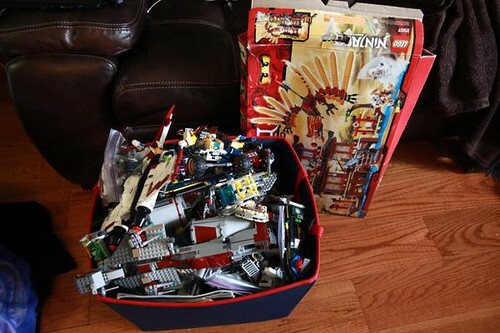 It was a big bin filled with LEGO and partially built models. And there were four boxes in the background. Everything was priced at $250. I figured I’d ask what the boxes were, and then make them an offer. At this point I was thinking more like $150. When they responded, I was happy to hear one of the boxes was for the 75021 Republic Gunship. Sweet! I love that model. The next box sealed the deal. A 10228 Monster Fighters Haunted House. O. M. G. I reply immediately, “What’s your address? I’ll be right over.” At this point, I’m totally fine paying their asking price. No way am I missing this set on price. I get to their house, and as we’re talking, I peek inside the 10288 box. (It was opened) I was jumping up and down inside when I saw it full of sealed bags full of sand green bricks. I can’t get out of there fast enough. I handed over my cash, and they helped me load up. Then I was on my way! I immediately started giving everything a once over. I was seeing tons of Star Wars stuff, but very few Star Wars minifigs. Weird. I saw The Batcave, but no Batman. Well that’s disappointing. The next day at work, I see another ad for a large LEGO lot from the same city. Could it be? I quickly email the seller. No way was I going to miss this. I was hoping the missing minifigs would be in there. Here’s a picture of the second LLL. I was was right. This large LEGO lot was packed full of more Star Wars sets, and a load of Star Wars minifigures. As I go through things, and re-built sets, I’ll post my progress. After a quick scan of the second lot, still no Batman. *Did I just coin a new phrase? I think I just did!